The beauty of marketing lies in the fact that it’s constantly evolving and, as a company, you need to adapt as quick as possible, otherwise you risk missing the train. And, obviously, by train, we mean a lot of potential clients! Nowadays, we’re living in the era of internet marketing, as mass media is no longer being the most popular environment in which you should push your message. After all, we’re talking about an audience about which you don’t know anything, like if they’re interested in your product or service, right? Still, some people are not yet convinced that it’s actually worth investing in Internet marketing. If you’re among them, then you’re in the right place, as we’re now trying to change your views on this by showing you a few reasons why it’s actually worth it! Recent studies revealed that more than 85% of the adults in the United States and Canada are present online, also using online media for local shopping. 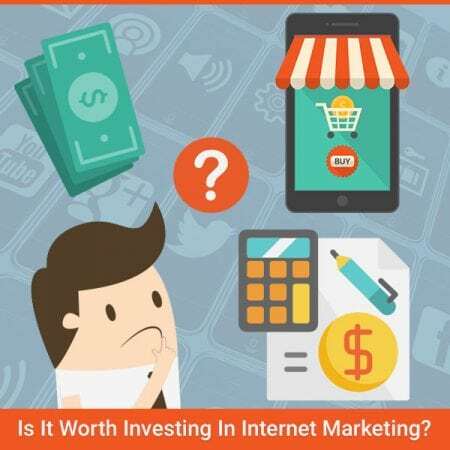 This should be an argument solid enough to make you invest in Internet marketing. Unless you don’t want to miss a lot! Companies who focus on online marketing actually have a reduced cost per lead – with up to 61% – compared to those who still rely on traditional methods. And if you ask us, this should be a difference big enough to change your mind. After all, this is your budget we’re talking about! When it comes to traditional marketing methods, the biggest disadvantage is the fact that you will have a hard time measuring your ROI, since it’s difficult to know how successful a newspaper ad is, for example. You don’t know how many people viewed it and how many actually bought something from your after. When it comes to online marketing, things are easier: you can see everything, from visitors reaching your website to customer feedback and detailed reports on how your ads perform. If you can measure your online marketing efforts, this also means that you can use all the data about your prospects and find out valuable insights. To be more specific, we’re talking about , the typical buying cycle, as well as the company’s sales pipeline, all these helping with your overall business strategy. Obtaining visibility in traditional media is far from being easy, but Internet marketing actually gives you the opportunity to develop thought leadership, through techniques like content marketing, for example. A few great online articles will help you become a household name for many of your potential clients. And this is something you would really like, right? In the past, scalability didn’t use to have the same reputation as nowadays, as profitability was actually the number one target of anybody investing in traditional marketing methods. But things have eventually changed and now you can totally scale your marketing efforts, depending on the results. If profitability is down, you can just scale back the entire marketing expenditure for a while, simple as that. These would be just a few of the reasons why we believe it’s worth investing in Internet marketing and we really hope that we also convinced you to do it. If you don’t have the background needed to start a campaign, you can leave professionals to take care of it. IB Systems is present on the market ever since 1995 and immediately understood the impact of Internet marketing. Their vast experience is just one of the reasons why you should choose them for your first online marketing campaign!